I got my C8F after 5 weeks of shipping, maybe it got lost, but I have it now so let’s gets started. 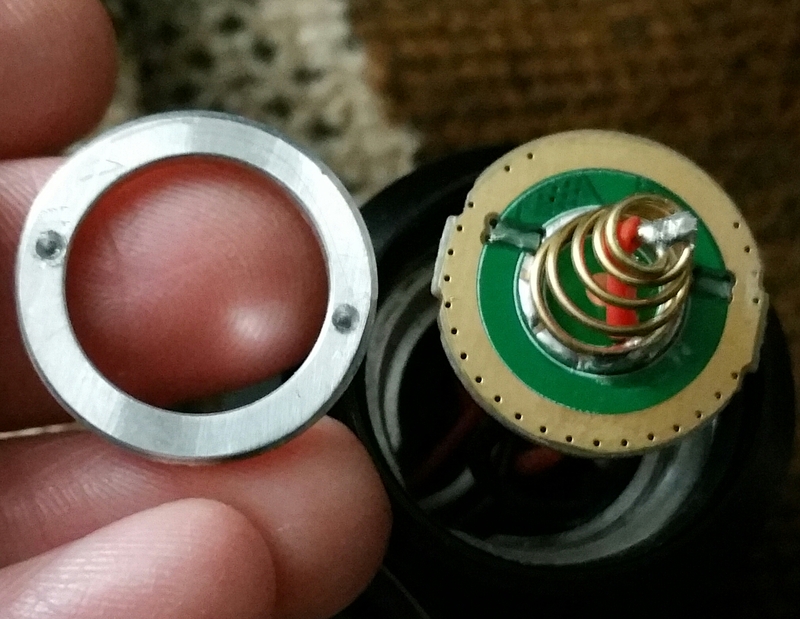 The driver retaining ring had a very small amount of glue and came loose with a bit of force from snap ring pliers. 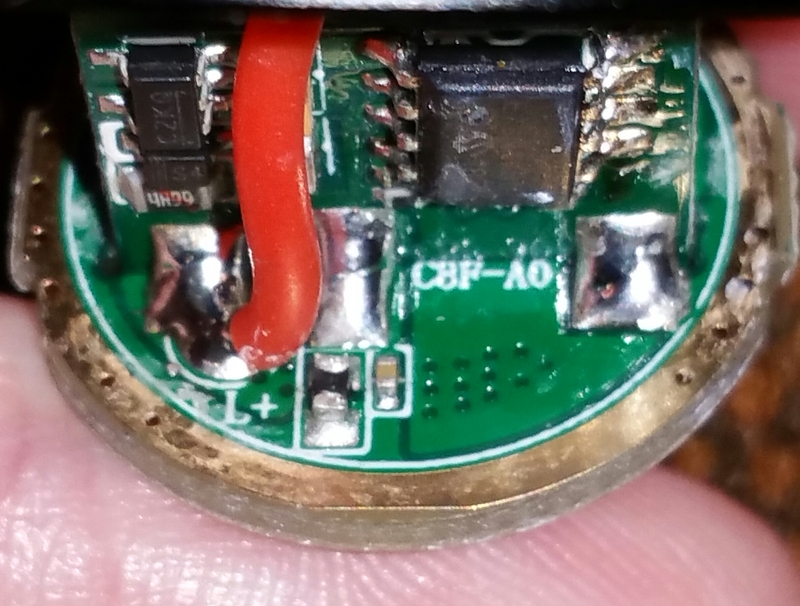 The driver is 21mm and is composed of 2 boards soldered together. Here’s a closer look at the components. The back of the switch had a little bit of glue holding it in place. I was able to push it out from behind with a little pressure. I only had it for an hour, so I have more testing to do to figure out the switch circuit and measure the candela. Output was below spec with about 2300 lumen on a 30Q and 2600 lumen on the stock Sofirn 21700. This was measured on my Texas_Ace Lumen Tube calibrated with one of Maukka’s calibration lights. Amp draws were made using a heavy wire an a Uni-T UT210E clamp meter. The 3 measurements are: turn on, 20 seconds and 30 seconds. 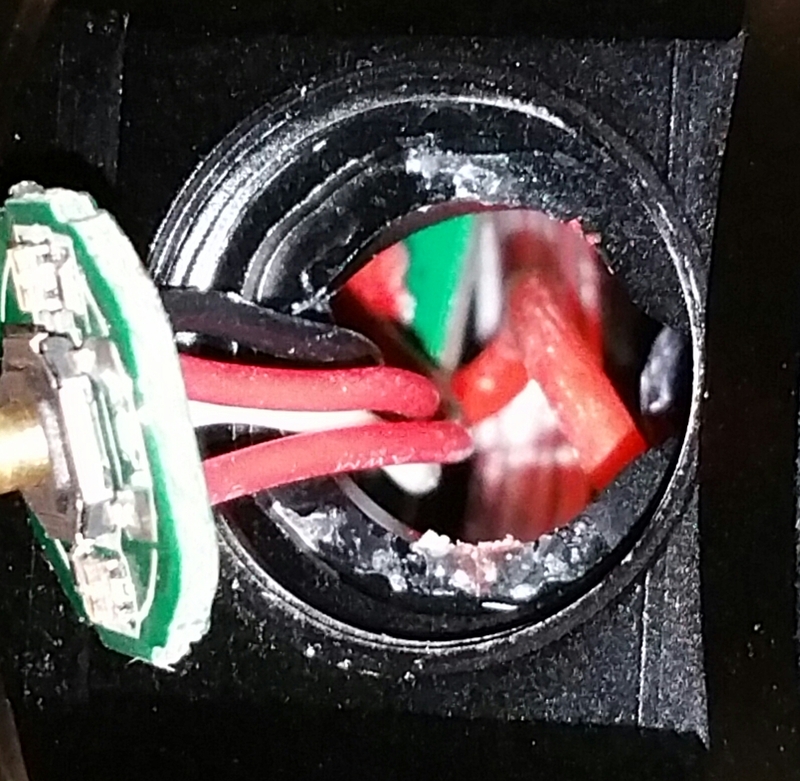 Parasitic drain was a very low 77 micro amps. No issues with that. 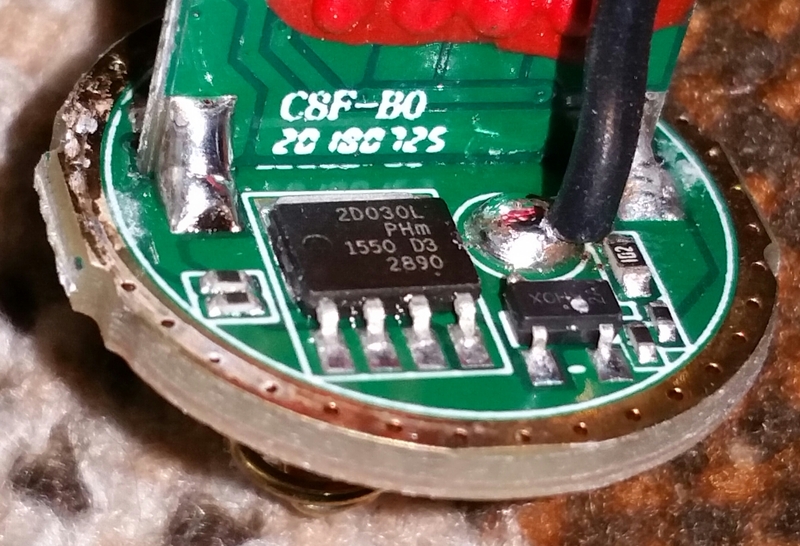 The Sofirn battery measured 28-32 milliohms internal resistance on my Miboxer C8-12 charger. Candela is 33kcd or 363 meters. I’ll post up a link for a clear switch cover as soon as I find one. 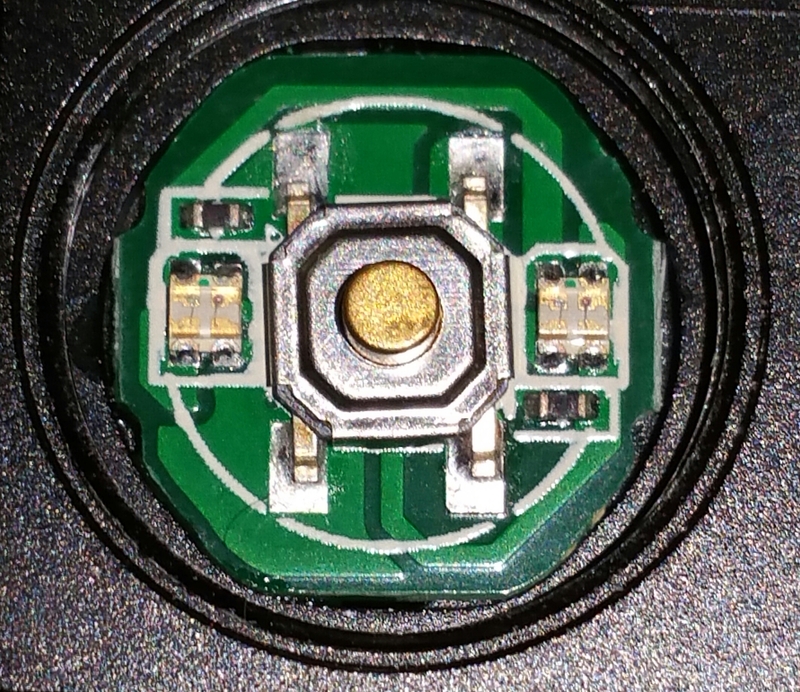 Update: See post 14 below Also, l left out the switch cover dimensions for the bottom sealing lip, it’s 1mm thick. I could not find any company offering this size. My general impression is really good. The light feels good in the hand and I would definitely buy it in a 26650 version if Sofirn chose to make it. The 5700K color is quite nice even though I prefer cool white. I’m going to keep the 5700K as I see no need to change it. I’m not a fan of the stepped modes due to the one click on and press/hold for off, but I really like the ramping mode. It gives you one click on/off. True, the ramping speed is a bit fast on the low end and a bit slow on the bright end, but it doesn’t bother me at all. I usually set it at about 500 to 1000 lumen and occasionally dbl click to turbo. I like it and don’t see a need to swap the driver. 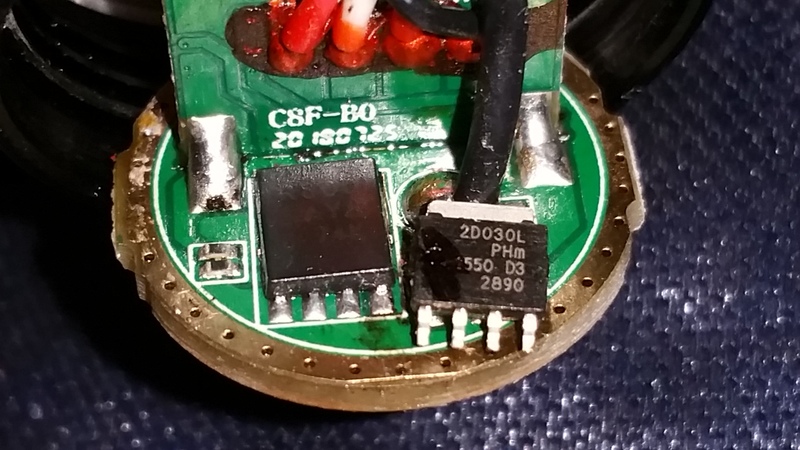 I’m hoping we can figure out if there is a component on the driver that can be swapped out to improve performance. Maybe the FET? I’m also going to try and rig up a constant light under the switch while retaining the stock battery indicator lights. More on that later. One other thing to add is that my battery has a dent in the negative electrode. I’m guessing the box was dropped on the tail end and the batteries weight fully compressed the spring and the solder blob from the bypass wire dented it. It seemed to charge up fine at 3A without getting warm. 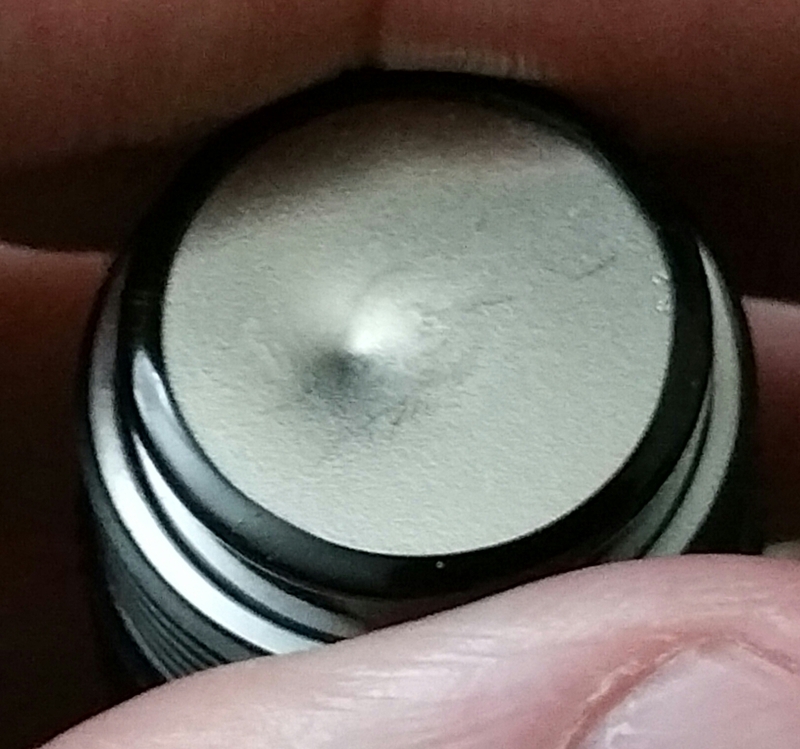 This dent makes me uncomfortable about using the battery, though. Do you think I should get it replaced? I have some batteries with much worse dents and they work fine over a year. This should be no problem if it is charging well and works fine. I may buy a Samsung 30T, 40T and 50E just to try them out. Me too….Specially the 20700-21700’s My Sofirn battery is slightly dented dead center on the cathode side, the anode side is collapsed a bit. 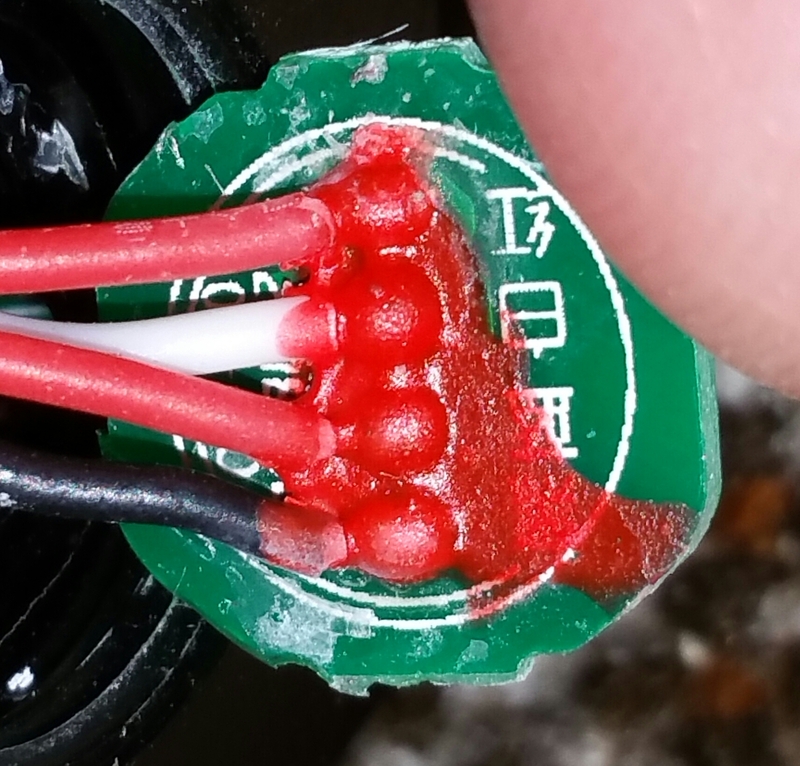 Be careful swapping out the FET.. the masking isn’t the greatest…. tried putting a SIR404 on the stock driver. Should of just snipped the legs and then with a small solder tip to remove the remains. 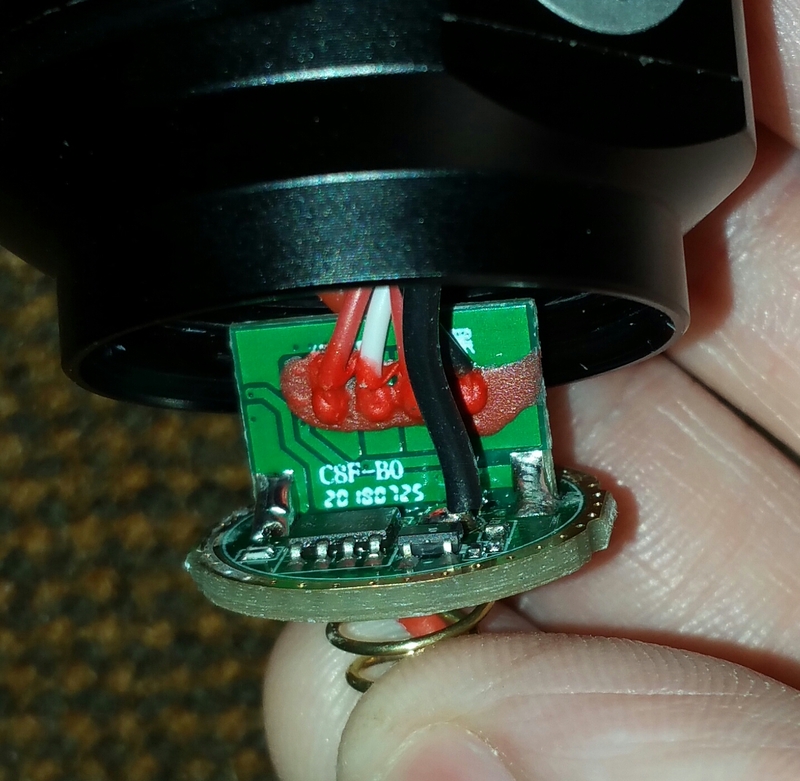 Tossed the stock driver and went with the D4v.2 with a Infineon FET 20awg leads… now she’s putting out! 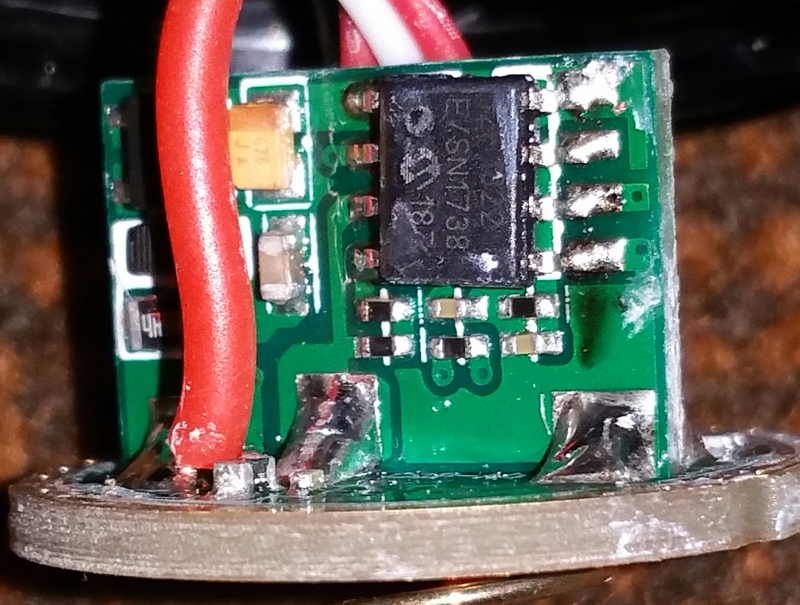 p. Be careful swapping out the FET.. the masking isn’t the greatest…. tried putting a SIR404 on the stock driver. Should of just snipped the legs and then with a small solder tip to remove the remains. 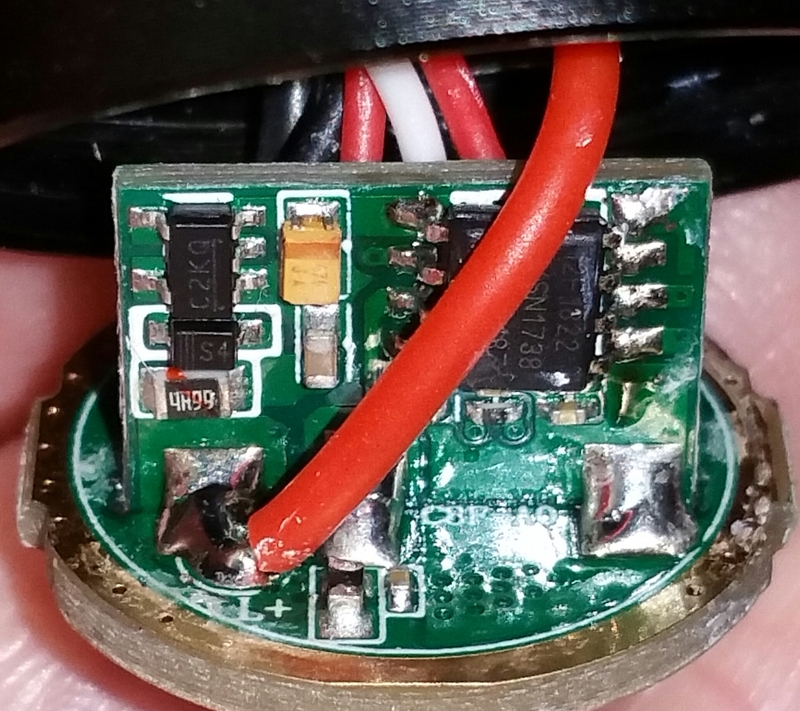 Tossed the stock driver and went with the D4v.2 with a Infineon FET 20awg leads… now she’s putting out! Okay, so we still don’t know why the output is so low? I think the led wires pretty thin and long. I will replace them with 18 AWG wires and see what it boost. If that didn’t help much I will try the fet replacement. But mine does 3100 lumens stock so I don’t know if it jumps a lot. 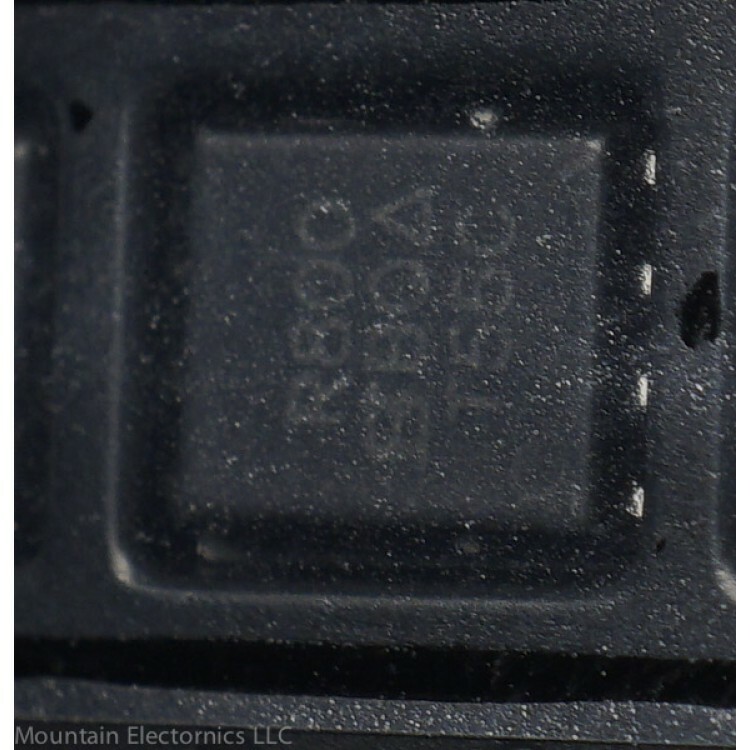 Would this be the correct size mosfet? This one will fit even though the exterior is different, no legs? I can buy from MTN, thanks anyway. Yes If it says LFPAK56 also. That describes the footprint and casing. Both top of ramp and dbl clk turbo are the same. I measure 33kcd or 363 meters. A good mix of flood and throw and great for walking around at night. Those lumen numbers seem about right. I think I got 2800 lumens with the 30T at 1s but too lazy to charge and test again. Thanks for the tear down pics. My C8F arrived about a week ago – also a long time enroute. No damage or dents to the already installed battery. The battery is a Sofirn labeled 21700 claiming 4000 mAh and 40A. After fully charging at a rate of 1.0 amp I ran the light until the battery fell just below 3.0v then fully recharged the battery to 4.2v. It took 4127mAh. I like the light but initially found the UI more confusing than most. Getting to the ramping group (not its default) took several tries. Pocketable in an overcoat or windbreak. A good blend of throw and peripheral light. Weighs a little more than a half pound (264g) with battery. Nice solid feel. Balances perfectly on my forefinger. Good heat management. Phase 1 of my switch mod is complete. Converting the boot to a clear one. No one seems to make a clear version in the right size. It’s 14mm wide at the base, 11mm wide at the bezel and 4mm tall. I was able to trim a cover from a Convoy L6. It fits! It sits about 3mm higher actually, but it works really well and I can find the switch a lot easier. Phase 2 is making an led stay on all the time, like I did with my other lights, but still keeping the battery indicator function. Ps, Sofirn has commented that it is the FET on the driver that is causing the reduced performance. If your light is making under 3,000 lumen with the 21700 battery you can contact them through a PM about getting a replacement driver. Nice switch mod JasonWW. Much more visible from the side. Having the LED stay on all the time will be a big plus. I appreciate your posts. I just got some new FETs from MTN today and swapped it out. I gained 2A more at the tail and 350 more lumens @30s. There is a more instant jump to Turbo as well (Edit: There is still a little bit of ramp up, but it’s less noticable). I left the stock led wires. So tail amperage went from 7.15A to 9.2A and lumens from 2,560 to 2900. I could probably get more output by replacing the led wires with 18ga, but this is fine for now. I also ordered a Samsung 30T and a 50E so we will see how these perform. Thanks for sharing the data. Did you also request a revised driver from Sofirn? Yes. I did not know if I would succeed with the hot air swap. I might have accidently blown tiny resisters right off the board! Luckily, everything went smoothly. I had my air flow at the lowest setting and added flux around the edges. I tried 300*C, but it wasn’t enough. 340*C got the job done. I brought the temps up slowly so my old FET is probably still good. Once removed, I wicked all the old solder away and the pads looked fine. Added flux and put fresh leaded solder on the pads. Added a bit more flux and set the new FET into place. I heated everything up slowly then focused the heat on the FET. It dropped into place and I pressed down on it to squeeze out any excess solder. I’m glad to see that the hot air gun in my soldering station works so well. 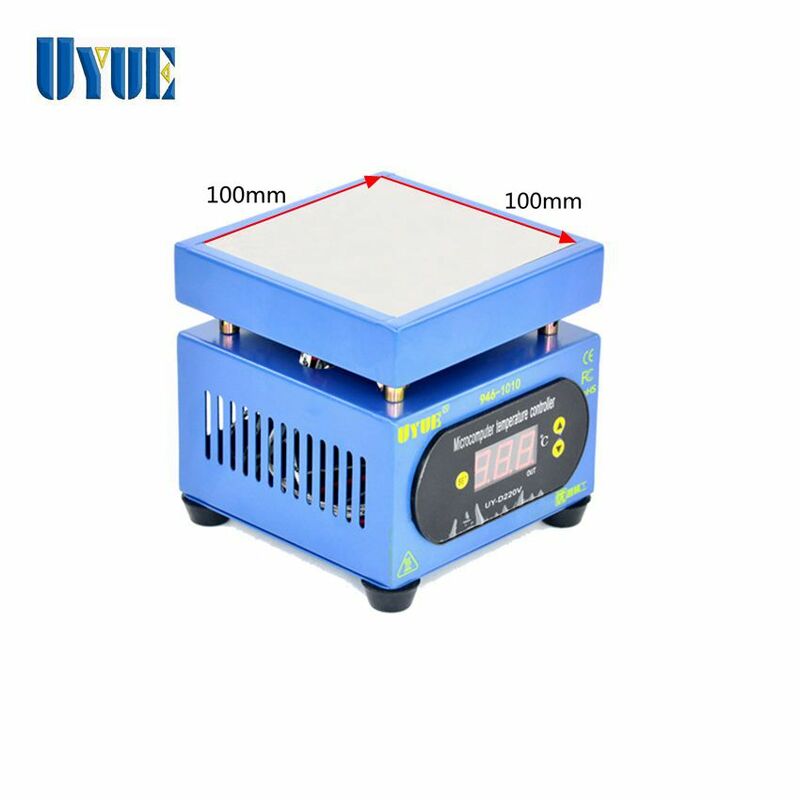 Maybe use this hot plate might make it safer and easier? I can probably get by with blowing hot air on the bottom of the mcpcb. I don’t see a need in buying yet another specialty device just for leds that I might do one per year. I use small round elect, Skillet from caravan with thermostat. Nice work Jason More instant Turbo? Are you still seeing a bit of climb? More instant Turbo? Are you still seeing a bit of climb? I’m looking at it very carefully right now. If I set the brightness level a little below Turbo and then double click, it looks like the output drops a little bit and then it ramps up to the Turbo level. Very strange. From a lower level, like 500 lumen, it seems to do a big jump in brightness then a little ramp up to full brightness. It’s not too bothersome and better than before. Now that Lexel is using Anduril, I may see about getting a new driver from him. I mainly want to try out that UI, but this stock driver seems to be fine for normal use. Lexel had to order some boards special for the C8F 21700 due to this size and retaining ring. When my Mtn one gets in i’ll let you know how it works out. Only FET+1 though. I only ordered hosts though so my LEDs will probably be LH351D or something I have sitting around. I see where I said the wrong thing earlier. I always try to get the lead free solder off the boards and replace it with the good leaded type. I bought it but haven’t even opened it. Don’t have space on my desk for another flashlight related item. I prefer just buying the emitter already soldered onto the mcpcb from Clemence and Kaidomain. Much easier. How many lumens do you think a Skyray King would output? 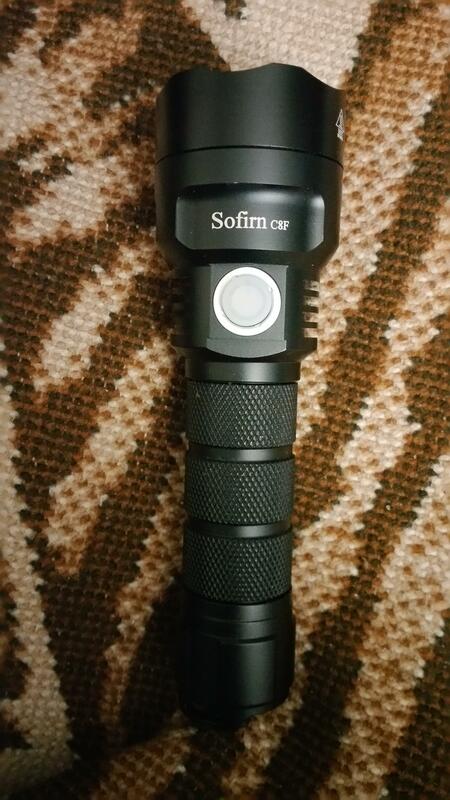 I had a customer who purchased a C8F XPL 18650 version and he already had a Skyray claiming 2000 lumens with 3x XML’s. He got angry saying I was selling falsely rated lights and his Skyray was much brighter because it threw further. 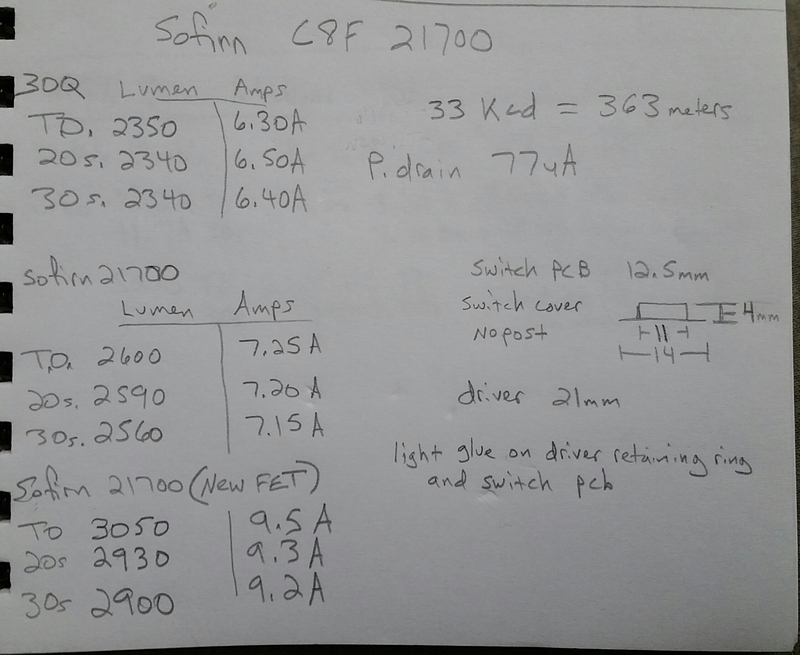 I measured the C8F to be 2700 lumens. Ended up saying that the different reflector on the Skyray could be making it seem brighter when it’s actually not. What do you guys think? Would like to get the facts in case I come across another unhappy customer. 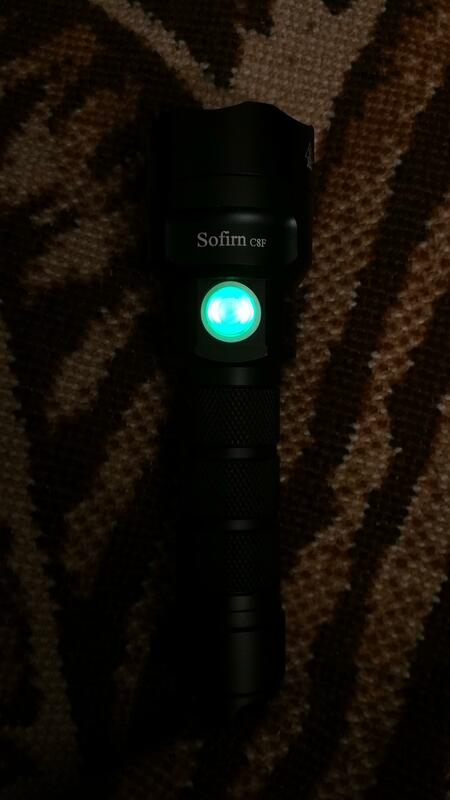 Love now having the TA Lumen Tube to see that the Sofirn rating was accurate. He may have been refering to the lux as brighter and not lumens. The SRK should have a smaller hotspot due to its bigger reflector so it might be more intense and throw further. The C8F puts out a larger diameter hotspot. Meaning it’s higher lumens is spread out over a wider area so it doesn’t look as intense. Lumens is about total light output. 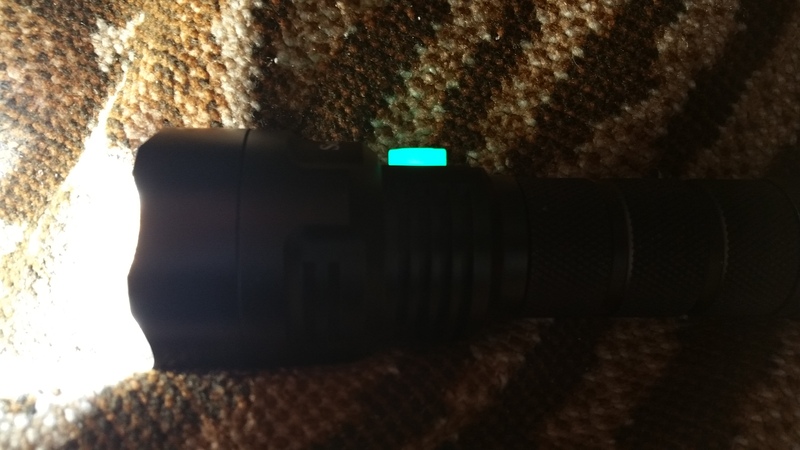 Dont know about the skyray king bit my c8f 18650 I measured 3,155 lumens running on fresh vtc5d batteries and cleaned contacts. 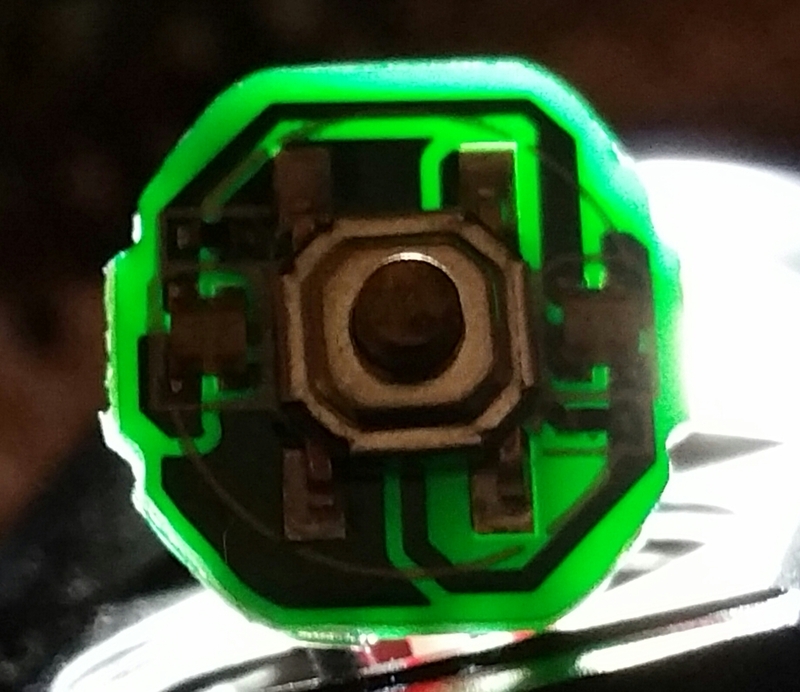 My 700 lumen Skylumen Delta throws several times farther than my C8F. Your customer is confused between lumens and throw. You shoukd tell him to ask on BLF.